The big item of the week: David Brooks mentioned my Center for Opportunity Urbanism in a recent column! It's good to see our message getting out. Joel Kotkin in City Journal: The Battle for Houston: America’s most opportunity-rich city faces a long-term challenge from “smart-growth” advocates pushing for more regulation. The New Zealand delegation I helped host in Houston to explain our free market development model has released their report with recommendations to ease New Zealand's outrageous housing costs, including implementing a version of Houston's MUDs to stimulate development. Hat tip to George. The Antiplanner on Tracking Housing Affordability with a lot of discussion of Houston. "Commuters who use public transit typically use their regular route on the order of 500 times a year. If they also take public transit for non-work trips around the city, the number goes even higher, perhaps 700. In contrast, people who fly only fly a handful of times per year. Frequent business travelers may fly a few tens of times per year, still an order of magnitude less than the number of trips a typical commuter takes on transit." "Clearly, at $4 per ride, bus-rapid transit is the most cost-effective use of transit dollars. Bus-rapid transit requires minimal new infrastructure, and most of that infrastructure won’t become obsolete if and when driverless ride-hailing replaces transit. Bus-rapid transit also tends to have smaller cost overruns and ridership shortfalls than rail projects. Still, when buses can carry riders for $4 per trip, why are cities planning rail lines that cost $10, $20, or $151 (!!!) per trip? A big part of the answer is the desire to get “free” federal dollars." Autonomous taxis are coming faster than we expect and they will be very disruptive, especially to transit agencies, which will either learn to embrace them or obstruct them (sadly, I expect a lot of the latter). Hat tip to Oscar. Can Transit Survive Driverless Ride Hailing? Speaking of impressive autonomous vehicles, check out this very cool video on Zoox (hat tip to Oscar). New Orleans (9) – 2002 Super Bowl, 2003 Final Four, 2008 NBA All-Star Game, 2012 Final Four, 2013 Super Bowl, 2014 NBA All-Star Game, 2017 NBA All-Star Game, 2022 Final Four, 2024 Super Bowl. Houston (8) – 2004 Super Bowl, 2004 Major League All-Star Game, 2006 NBA All-Star Game, 2011 NCAA Final Four, 2013 NBA All-Star Game, 2016 Final Four, 2017 Super Bowl (LI), 2023 Final Four. Phoenix (7) – 2008 Super Bowl, 2009 NBA All-Star Game, 2011 MLB All-Star Game, 2015 Super Bowl, 2017 Final Four, 2023 Super Bowl, 2024 Final Four. Indianapolis (7) – 2006 Final Four, 2010 Final Four, 2012 Super Bowl, 2015 Final Four, 2021 Final Four, 2021 NBA All-Star Game, 2026 Final Four"
Today's guest post is from Houston Freeway's Oscar Slotboom as a followup to my recent post on the early draft MetroNext plan. How can very limited available public transit funds be used to achieve maximum benefit for the Houston area? I suggest that the guiding principle should be designing for the future, not the past. Light rail is very expensive and very slow, with new mileage likely to cost in the range of $150-200 million per mile. Commuter rail (expected to be under the authority of an agency other than Metro) is expensive and slow, costing at least $50 million per mile. Both are fixed, inflexible and usable only by trains. Light rail is extremely slow, suitable only for short distance travel like 5 miles or less. 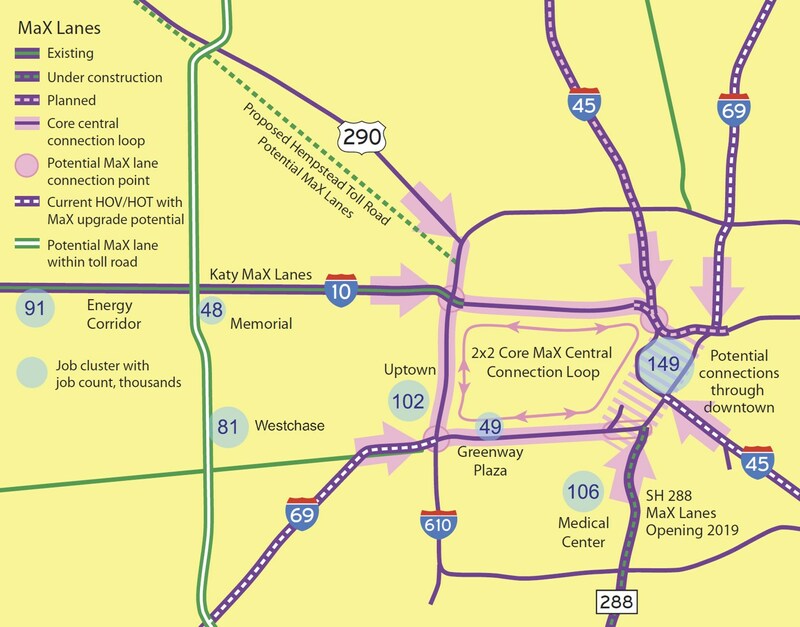 HGAC projections show the percentage of jobs inside Loop 610 will drop to 16.6% by 2045. A downtown-centric mass transit system will serve a declining percentage of overall regional travel, and the need to serve so-called long and thin routes (i.e. routes with low ridership) to points outside downtown will increase. We don’t need more high capacity transit, but instead need more routes that can be affordably operated to more destinations with low rider counts at high service levels. Transit technologies of the past cannot affordably meet the future need. While the future of autonomous vehicles and their impact remain speculative, recent reports detail impressive progress. "If self-driving cars make ride-hailing cheaper and more convenient, the research suggests, it could take a wrecking ball to public transportation. Strangely, the head of Phoenix’s public transportation agency agrees with that assessment. Zoox (with impressive video report) is developing an all-electric robot taxi which is potentially highly suitable for transit service. The vehicle travels in both directions and can move sideways with its four-wheel steering. It is being tested in downtown San Francisco, and Zoox is among only three firms (along with Waymo and GM’s Cruise) that are currently known to be well-along in urban testing. At least 6 other major efforts are in progress (see chart), which currently are reported to be less far along than Waymo, GM Cruise and Zoox. While decentralization of employment is virtually certain in the future, the impact of new technology on public transit is unknown but could but be hugely disruptive, potentially substantially reducing demand for traditional public transit. That’s why we need a plan which is adaptable to whatever the future may bring. For future planning purposes and MetroNext, it really does not matter if autonomous vehicles become available in 5 years or decades in the future. Anything built in the MetroNext plan can be expected to be in service to the year 2100 and beyond. MetroNext needs to be ready for autonomous transit, if and when it comes, but also maximize mobility benefits of transit investments if autonomous transit is slow to develop or has a minimal impact. In this case we need to serve dispersing employment with expanded service to more job centers at an affordable cost. Low-cost designs will maximize the number of these routes. In this case we can envision traditional transit serving mainly a few high-volume destinations such as downtown, but most other transit will be served with public or private autonomous vehicles. In this case the focus of transportation agencies may totally change, perhaps with public transit agencies subsidizing fleets of autonomous vehicles to serve low-income communities, and perhaps shifting their focus to build and maintain autonomous vehicle guideways to provide premium high-speed service for robot transit taxis. What we need: Transit investments that won’t go to waste when demand for traditional public transit collapses. We need transit facilities that are readily usable by autonomous vehicles and regular (non-transit) automobiles. Metro could have as little as only $1 to $2.8 billion available for capital projects in the next 20 years. If new light rail costs $175 million per mile, that money could be burned up with only 6 to 16 miles of light rail. We can and must do much better. Due to Metro’s limited financial resources, Metro should partner with TxDOT to build key transit links in our future system. TxDOT will do the financial heavy lifting, minimizing the cost to Metro, but full political support from Metro and the City of Houston will be needed. Both Metro Plans A and B show BRT on this section. On the west end of this section are the existing Katy Managed Lanes, and on the east side new express lanes are planned as part of the downtown reconstruction project. These two sections of managed/express lanes need to be connected. This section needs to be expanded, with four new MaX lanes and possibly a separate BRT as included in the Metro plans. I can envision a potential plan where the current westbound lanes are converted to MaX and BRT lanes, with new main lanes built on the north side. Metro’s plan A shows BRT on this corridor and plan B shows a “partnership project”. This section is currently under preliminary study by TxDOT, and this corridor should be widened to add four MaX lanes and potentially BRT. 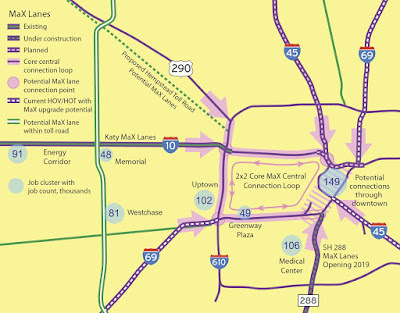 MetroNext has no new plans for this corridor, since the Post Oak bus lanes will open soon. TxDOT has proposed four express lanes on this corridor. The express lanes should be designed to be usable by automated transit vehicles which need to pass through this congested area. 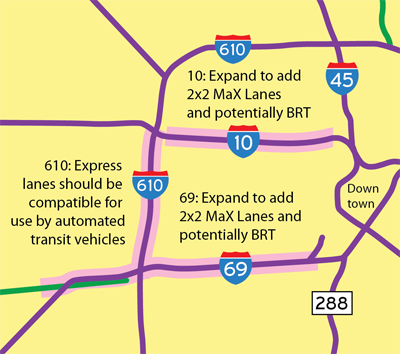 This will involve connections at both ends, and possibly a third express lane in each direction for exclusive use by transit and automated vehicles. MaX Lanes as proposed by Tory are ideally suited to provide the kind of service needed in the future. We can envision a future with buses, automated transit vehicles and HOV using regular streets, MaX lanes and dedicated transit guideways to serve a vastly expanded range of transit routes with high levels of service at speeds much faster than traditional transit. This is a three-part report on how Houston has met — and will meet — the challenges posed by Hurricane Harvey. Part One defines the city and region’s trajectory, and its fundamental resilience. The second part addresses Houston’s urban form, and how the right planning choices can provide some solutions to the problems of flooding. The third part lays out specific suggestions for balancing growth with environmental sustainability. As leaders and policy makers address post-Harvey issues, we present the steps they can take to make Houston more resilient, while still allowing it to retain its character as a region of opportunity. We demonstrate how actions that raise housing costs will make the Houston region less competitive with other parts of Texas, and with the nation as a whole.